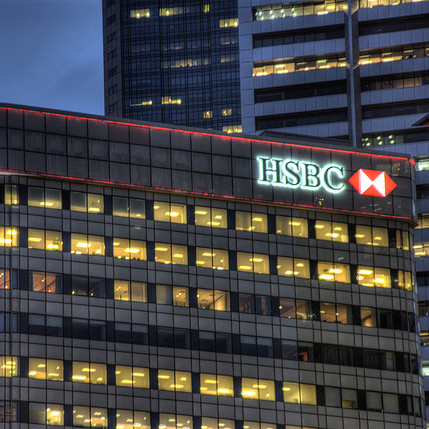 The Dividend Drive: BUY: HSBC--A Rare Chance to Tap into its Dividend and Growth Value? BUY: HSBC--A Rare Chance to Tap into its Dividend and Growth Value? It does worry me a little that I am now quite heavily biased towards the banking sector in my portfolio. Of course, the diversity that I am looking to achieve is going to take some time to form. However, banking now takes up around 37% of my equity portfolio (holding both Barclays and Banco Santander). Nonetheless, HSBCs recent price drop was far too attractive for me to miss. But why? HSBC is of course a global banking giant--the self-declared 'world's local bank'--and as such does appeal to me. With Barclays and Santander in my portfolio I already feel that growth in Africa and Latin America is well factored into my portfolio. However, for Asian growth I really wanted to look at HSBC or Standard Chartered both of which have had their share price hit recently due to the Chinsese slowdown--a perfect entry point. To be honest, it could have been either HSBC or SC I chose. Both look like excellent long-term holds (indeed, I may in the future also take a small stake in SC as well although that would leave me hugely placed in banks). I chiefly chose HSBC due to the fact that I better understand where it succeeds. I recently moved banks after being part of one of the Royal Bank of Scotland's brands, and was highly attracted to First Direct (a HSBC brand). In the end, I went elsewhere but the service and quality of FD impressed me greatly. Similarly, HSBC sailed through the 2008 financial crisis relatively unharmed and its dividend payments were consistently maintained which is very appealing as well. What is equally striking is the forecasts HSBC has which suggest to me that even in the short and medium term it is a strong candidate. It has a consensus P/E ratio for this year coming of around 11.5 with that dropping to 10.5 for 2015. The forecasts are, however, a little more unclear when you look at teh range they offer. For 2014 they have a divergence of about 50% suggesting that the P/E could be anything from 11.5 to 14.5 (see below). For 2015 these figures improve a little even if the divergence stretches further to 58%. In reality though, a P/E of 14.5 does not make HSBC any less attractive to me. Chiefly this is because of the dividend yield which looks very healthy for both 2014 and 2015. According to forecasts it will grow to 31.26p this year and 33.73p next. This would offer a yield of 4.98% and 5.37%. What is more, the dividend cover appears fairly healthy. The golden figure here would be 2 (meaning that the dividend would be covered twice by earnings). The consensus P/E suggests that the cover for these dividends would be around 1.75 for both 2014 and 2015. This seems good to me. Even with the smallest EPS predictions the dividend cover would be 1.38 and 1.39. This would not be ideal, but I would be surprised if this weighed down the dividend payment too heavily. The book to market value looks very nice as well . I bring it out as 1.58 which is nicely over the 1 value which signals that a stock is undervalued according to its assets. Overall, I expect that HSBC will be a good long-term hold as the economy continues to recover. Currently I have only made a modest dip into HSBC. However, if the price continues to remain low or even lower still I will likely make another dive for the shares once my investment pot grows a little. Did anyone buy Standard Chartered over HSBC? What were your reasons? Do you think HSBC will continue to show the growth it did in the past? I have HSBC on my radar, together with Legal & General, they seem rather interesting stocks right now. Compared to when you entered HSBC it's even chaper, and surely the crisis in Asia will not last forever (though I expect a good 1 year of woes to go)... I have to look into their dividend history first, but all other data seems quite fine to me... that's all really, with 4 months gone after you went in, do you have any second thoughts? You're right. It is now over a year since I first dipped into HSBC. I made tow further large purchases since (the last in February). The crisis in Asia could certainly rumble on for some time. But we should have it in perspective. The region is still growing--and growing fast--juts not as fast as we thought. Some countries in the area (China, in particular) are experiencing growing pains as they try to find their place in the global economy. All told, even if it is an uneven progress the end result should be better. HSBC is, of course, perfectly placed to take advantage of this. Any second thoughts now? Not at all. If I didn't already have such a large position in HSBC already (and, indeed, banks generally) I would be happily topping up. Certainly I am keeping the automatic dividend reinvestments on to pull in a few more shares each quarter. Their future looks very bright in general. Their dividend history is solid (and excellent for a bank) but not spectacular. Well worth a look though. I agree that Legal & General look good as well. I am often tempted to top up my holding in them which I only opened in May this year (you may have seen my post on this already?). they do look very good as well as do Old Mutual. We will see! CIao DD, got HSBC today, and planning to open L&G too. Since I do not have financial positions opened in the UK I am wondering if I should go with "safer play" stocks like Amlin or Pru, so I am stuck in research still. Good luck with HSBC. It should serve us both well in the future! Good question. Amlin obviously has a few issues in its industry at present. But looks more than able to weather them and keep the dividend going strong. Prudential is a classic quality company. However, if the Asian market does take a serious pounding it will follow suit as well. That being said, L&G has growing exposure in the region. I am not sure that--other than dividend-wise--L&G are any less "safe" than Amlin or the Pru though. The reinsurance business is merely struggling to find growth at the moment. They have these peaks and troughs periodically. Beazley is an attractive company. It operates in a number of niche segments where it is a leading light. Yes, most of the big insurers (except Pru) got hit by the financial crisis. Prior to that their record was pretty good. L&G has been focusing on cash flow of late which is good and they have very large cash piles even for an insurer. That is certainly good!